Hi y’all! I’m Elizabeth from Nashville, Georgia and I’m in the Pink Group. Last year I decided to give SFG a whirl and the results were amazing! Great yield, small footprint, and minimal maintenance. This year I decided to do a “proper” SFG after last year’s test run. I’ve spent the winter drooling over seed catalogs just waiting for seed starting time to begin. Let me show y’all my garden plot (east is closest and west is at the far end). Last week I purchased eight kits (each kit is a box measuring 4 ft x 8 ft x 8 inches) from my local lumber yard for $35 a kit. The kit is very easy and quick to put together. The 8 ft lengths have male ends and the 4 ft lengths have female ends. All you have to do is just slide the male end through the female end, put the peg in the hole, and you’re done. That’s it! It took a whopping 15 minutes to put together all eight boxes. Oh, and the wood is untreated cypress. For those of you who are unfamiliar with cypress it’s more dense than cedar so the garden boxes will many years, it weathers beautifully, and the super-duper awesome bonus of cypress is that termites don’t like it. Can you tell I’m impressed with these kits? Yup, those are 4 ft x 8 ft cow panels from the local feed store. The reusable cow panels are sturdy and don’t get hot in our scorching summer weather. In the fall, the panels are easy to remove and throw on the burn pile to burn off all of the remaining vines. Easy peasy cleanup – just the way I like it! I would like to show y’all my garden plan and how I tried to incorporate companion planting this year. I used the Three Sisters plan in the sweet corn area. Last year I had a teensy problem with the corn falling over in high winds so I’m hoping Three Sisters will help resolve this problem. I am even going to test out my own variation of Three Sisters by substituting the squash with cucumber; hopefully it turns out well. I would love to hear your feedback, suggestions, and ideas to improve my plan. Thanks and happy gardening y’all! I put weed mat on the ground, but it degrades after a couple of years. What is on the bottom of the boxes? Do you lay sheeting down? 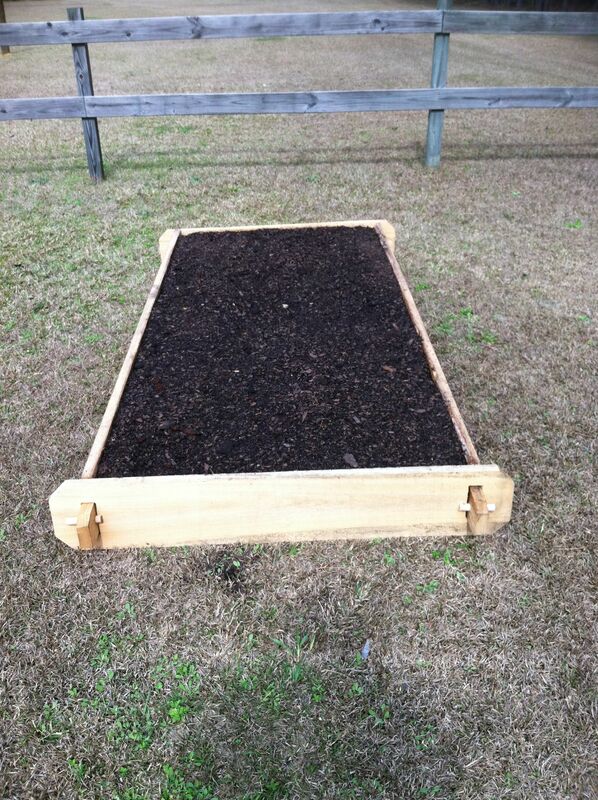 Is there a wood panel separating the soil from the ground? Elizabeth, where did you get the bed kits? I am in Memphis trying to find something similar, no luck so far. I don’t imagine they would ship something like that? I was laughing out loud at the deer deterrent. Thanks for the comment! I don’t have any “science” behind this suggestion; but we have been doing it in the south for generations. My grandmother has a sure cure for deterring deer in your gardens. Have all the men in the family (has to be male) pee in a 5 gallon bucket, then fill with rain water. Pour a stream (no pun intended) around the perimeter of the area to be protected and repeat every couple of months. There is no smell and the deer stay away. She also said something about midnight by the light of a full moon, but I don’t go that far. Try it, it works!! Oh yeah, she also said for pollination and strength, corn needs to be planted together. I use one whole square (4X4) for a “corn patch” planting. I also plant beans at the bottom of the stalks. I leave the pvc igloo up, and it helps keep the corn on its feet. The kids and I build a scarecrow with cut silver pie pan pieces hanging on him for making light reflections in the wind. After I harvest and the corn stalks have dried, I tie the stalks together to make 4 bundles to use for Halloween decorations. Since your garden work is minimal, you can think of all sorts of fun things to do…Good Luck!! Beautiful boxes and plans. I hope you have a bountiful crop this year. I live in the next county over from you. I really hope we don’t have as dry a summer as last year! Good luck!!! Excellent site. I really like the boxes. Great deal too! Thanks for sharing. I am new to SFG. Have done a lot of research and came across your page. I’m so glad I did, you are very informative. I am 74 years and have built four 12×4′ beds and four 4×4″ beds. 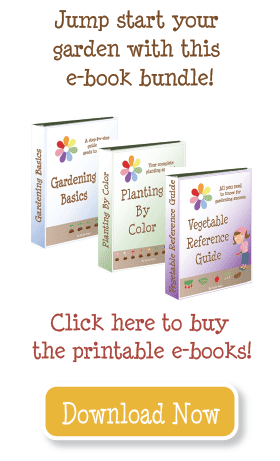 I’m using the vegetable garden planner from motherearthnews. The usual information I’ve been reading about vegetable plants are not complete but when I looked at your notes the information about fertilization is excatly what i have been looking for. In the past I have always fertilized at the wrong times so now I know. Thank you so much. Looking foward to the pics of your 2012 garden! I think this was my favorite post so far! Gorgeous place to live. And the garden plan is seriously impressive. Makes me miss the south. Emily – will you add Hyrum, Utah to your city list – and the color is Blue. I’ve been sending neighbors your way but Hyrum isn’t on your list yet. Thanks! Oh what I would give for that much space! I noticed that you often grouped same vegetables together as in traditional gardening, and wondered if you had thought about mixing everything up (tall plants always in the north end with progressively shorter things towards the south) to minimize the impact of pests? Another point is that different plants require different nutrients (3 sisters banks on this principle) so planting one corn in every single bed rather than all of them in the first bed might be a neat experiement for next year to compare to this year’s harvest. My best garden ever was a sq ft one grown in a ‘student ghetto’ while I was in University in pure rotted manure from my Uncle’s farm because it was free and all I could afford – best soil ever! My “3 sisters” were actually grown all in 1 sq foot per trio so that the beans and squash could reach the corn easily to climb, and they had more than enough space… so if your seedlings aren’t too big yet, you could do a few transplants and free up extra square feet for other veggies. The nitrogren fixing nodes on the roots of the beans will explode and replenish the soil primarily when they decompose, so make sure to leave them in the ground over the winter so your soil will be healthier than next year, better yet, plant a ‘green manure’ crop to be turned under in the spring wherever you grew corn (it takes 12 years for nature to replenish the nitrogen lost by growing corn just once). Best wishes! Love your garden. My problems last year were deer and squirrels. My yard is small and I really don’t want to use fences about my boxes. Any suggestions on how to deter these freeloaders? Your garden looks like it will turn out great! I am starting raised bets this year and implementing companion planting throughout also. Do you have problems with squash vine borers in Georgia? Here in Missouri they are terrible, getting 2 generations of them a season! All my squash and pumpkins were decimated last year! Just wondering if you have a secret for repelling and fighting them? I used cattle panels last year bent over in arches for my melons, they work so great! Happy growing! If you have the space, I think it is nice to have a patch for squash and pumpkins. Then you can just let it sprawl and it won’t be in the way of getting to anything else. A tip from a friend of mine–once the pumpkins are formed she makes sure they are sitting on their bottoms, so they grow evenly without dents and discoloration. Emily, Thanks for the great feedback on my plan! I’d better hop to it on some of those suggestions as I have little seedlings coming up already. I’ll have to rethink the squash/pumpkins…I may end up just putting them in a traditional bed and letting them sprawl. As for the cow panels, my husband has installed them (finally) so I’ll snap a few photos and send them to you. The panels are very easy to attach to the t-posts using little metal clips. I’m pretty sure “little metal clips” is not the technical term, but the nice folks at your feed store or even Tractor Supply will know exactly what you need. A quick flip of your wrist using a pair of pliers and the clip is easily attached & the panel is secured to the post. It’s surprisingly very sturdy. I love your gardens! I am so jealous of your huge amount of space. Between that and your lovely weather, you can do so much more gardening than I can! I’ve seen a couple of folks use cow panels–can you get another picture with them in action? How do you secure them? *Corn–often this needs more support. Because the soil is shallow and loose, the corn is not strong enough to hold up to a lot of wind. Check out the method I used to hold up corn. Mine had trellis netting horizontally across the top, but you could also just build the PVC grid so it cut the garden in quarters and would probably have most of the support you need. *Squash (including pumpkins)–are these going to be trellised or just sprawling? With a trellis you can probably give them just one or two squares, but if they will sprawl I think they will need much more. Keep them to the outside of the box so they can spread onto the ground. But a word of warning, it gets hard to walk after a while! I am not very familiar with the Three Sisters strategy–please let me know what you learn! *If you have a few extra spots in your potato garden–put them between the potatoes and cabbage. I find I really need at least 12″ of soil to grow potatoes well. If you wanted, you could probably double up one of your boxes to be taller. The strategy with growing potatoes is to remove most of the soil, plant the “seeds,” then replace the soil as the leaves grow–just keep covering them up until the bed is full. Because cabbage gets planted a few weeks sooner, you don’t want to disrupt those roots while digging about with the potatoes. *Cabbage–since you have the extra squares, give them a little more space. 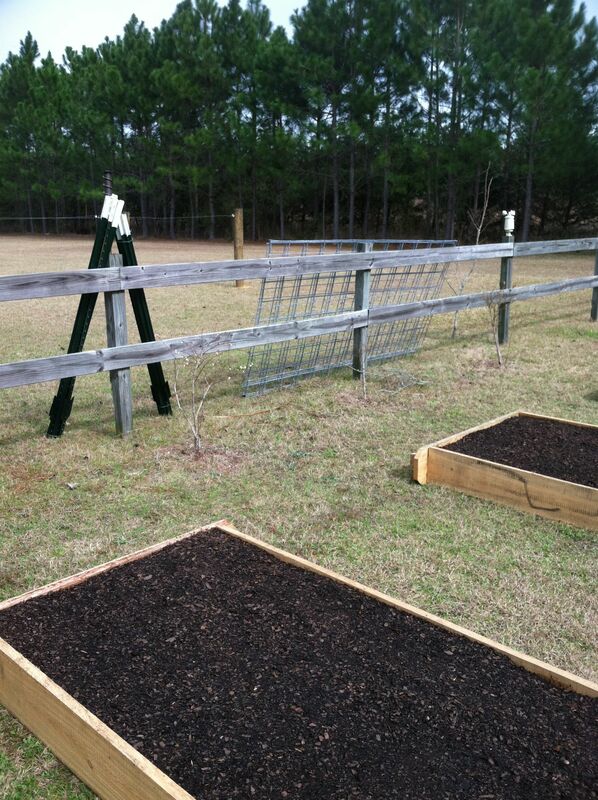 Then fill in between with a rapidly growing veggie like radishes or beets. *Carrots–don’t forget to plant these every 2 weeks or so, to stagger your carrot harvest. *Strawberries–you have plenty of space to dedicate to these, I would just suggest you plant them all in one bed, if possible by themselves. They will send out runners, and multiply. That makes them a bit invasive. *Are you planning to trellis the sugar snap peas? If so, perhaps move them all to the end of a bed where you can offer them support. *Lettuce–again, stagger the planting to maximize your harvest. *Broccoli–great call planting it by tomatoes. It will take up more than one space per plant, but the tomatoes will be small and allow it some room. By the time the tomatoes are big, the broccoli will be harvested. *Basil–You can dedicate an entire square to it, but also consider planting it among your tomato and lettuce. It helps repel aphids. *Peppermint–definitely keep it in a pot. It will spread like a weed. It looks wonderful. I really hope you will take pictures and post an update along with your harvest results! My local mom and pop lumber yard made the kits at the request of another customer who wanted 100 boxes. If you live nearby, you can give Guthrie Lumber in Cecil a call to see if they have still have some in stock. The lumber yard does not have an online store. If you don’t live locally, perhaps you can contact your local lumber yard (not a big box store) and ask them to make some for you. Good luck! Thanks Daisy! We used the cow panels last year and loved them so much we decided to keep on using them. I hope they will work well for you too. Lara, I’m so glad you like the boxes…I’m thrilled to have found them and I’ve convinced several neighbors to get the same kits. Last year went the lettuce bolted I planted nasturtium, borage, and a few flowers (mainly zinnia & stock). I’m considering trying New Zealand spinach this year in addition to nasturtium and borage. I haven’t tried shade cloths but I may just have to give it a shot and see how it works. What lumber yard did you purchase the kits from? I called around to a few and couldn’t find any. Hi there! 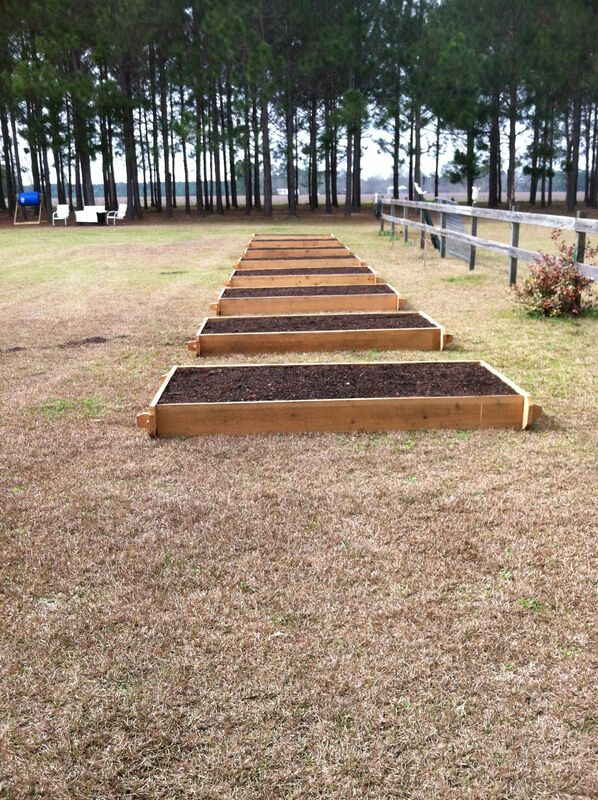 Your garden boxes look great! Can I ask, where did you purchase them? I have been looking everywhere for kits, and can’t seem to find anyone that has them, and if they do, they want a fortune! Great plan. I love your boxes! I wish I could find some of those kits here in Nashville, Tennessee…What do you plant in your squares after the lettuce goes to seed? Ours bolted by mid-June last summer, then I didn’t know what to do. Have you tried using shade cloths to extend their growing season? Wow! Great job and I love the materials you used! I may have to look into those cow thingies to use as trellises. Thanks for sharing!